I used to have a list on the refrigerator of lunch choices, but it has gotten a bit out of date. So I created a new one. It mostly includes dairy options because with keeping kosher meat is expensive. There are also only certain days the kids can bring meat to their Jewish day school. Below is my matrix of lunch choices (in green). It will be a great tool for adding to our grocery list each week. Then each day when we pack lunches, we will choose one item from each column. This way our kids will get a variety of foods and it will make sure that all of one type of food doesn’t get eaten up in a week! (I just bought a lot of Chex Mix on sale last week at Walgreens and if I let them, my kids would have it every day!) Feel free to edit this document for your needs and your kids’ tastes. ∞ Use up your leftovers when you can. This may not work as well for the kids, but the grownups can eat them! ∞ Make as much homemade as you can. We recently got a breadmaker and my husband is enjoying figuring out the best recipes to use. It smells so good when he has a batch ready to go in the morning, With all four boys in elementary school this year, we could easily go through a loaf of bread in a day! Our next project is to experiment with some homemade snacks. See Little House Living and my posts on “(More) Make your own…“ and “Don’t buy it, make it homemade – Part 3“ for recipes. ∞ Look for outlet stores. We recently found a local outlet bread store (thanks, Lori!) that saves us a ton on bread, bagels, and sandwich thins. They even have store coupons! ∞ Check out the sales at the end of this month. Pretty soon all the back-to-school items will go on sale, which means lunch bags, containers, and the like on sale for cheap prices (check out Target, Wal-Mart, drug stores, etc. for these deals). Last summer we got the boys their current lunch bags for $3 each! I love them because they have a zipper at the top and a space for their name on the back. I also got backpacks from Lands’ End at a very deep discount last summer! Be sure to stock up on those swimsuits and rash guards while you are at it, too! 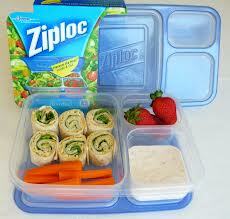 Do you have any tips for packing lunches that you would like to share? Please add them in the Comments section! Thanks Rivka H. and Jessi L, for your ideas I incorporated into the matrix. I often do things in bulk, like prepping the veggies and portioning out the snacks from larger sized containers. Then you just grab and go. I have a friend who has a lunch station with bins of different colors. The kids can take one from each bin (this is for the non-refrigerated items). I’m a little rusty with this since my kids are homeschooled! But I do have a snack drawer they can choose from if they are hungry – baggies of nuts, fruit leather, baggies of crackers, etc. And of course the fruit bowl! These are great ideas! I like the bins idea for when the kids are old enough to pack their own lunches. I try to keep snacks that are allowed on the bottom shelf of our pantry, too, so when I tell them to get their own snack, I know they will get the right ones. However, I do have one thief in the family… Great idea to prep ahead, too. Thanks for reading. I love your blog, too! Sorry I haven’t commented in a while! I freeze obj sandwiches up to a week in advance and just throw it in the lunch box in the morning. I wish we could do that, but no peanut butter allowed at school! Thanks for reading! I bought reusable containers online that work great. I am trying to get the kids more active in their own lunch prep. We haven’t done that yet, but should! We do have plenty of containers, though. I even bought a bunch more at the dollar store this year with 6 of us taking lunch each day!